With hundreds of prettifying products on the market there's no excuse for neglecting your beauty regime, but sometimes it's the bare necessities that give the best results. Open your cupboards, clear out the fridge and treat your skin to its very own pantry pampering. Who needs to spend a load of cash when the best beauty secrets are already hiding at home? The Body Shop, Clinique, Liz Earle and Nivea - it's kind of impossible to imagine our skincare regimes without a healthy mix of these SOS beauty brands, but once upon a time women needn't have looked further than their pantries. Oh yeah, we're serious. As much as we all love BBs, CCs and state of the art skincare technology, nothing beats pure and simple ingredients when it comes to caring for our complexions and our tresses. From makeshift Manuka Honey facials to sweet sugar lip scrub and coffee on your cellulite, raiding your kitchen could just be the best place to start in your quest for beauty. Why not make the most of your food shop and use some of old Mother Nature's best kept recipes? You'll never look at your fridge in the same way again. The skin benefits of raw honey are pretty endless. Not only does it contain powerful healing enzymes, perfect for tackling blemishes and discolouration but it's full of antioxidants too. Whether you want to zap away those pesky pimples or kick back with a full on facial, this multi-purpose ingredient is as sweet as they come. For a taste of the simple life, pour half a cup of honey into a mixing bowl and apply all over the face and neck using your fingertips. To make the honey easier to work into the skin, splash your face with water and pat dry. Leave the mixture on for 15-20 minutes or overnight for best results (if you can protect your pillows). Thanks to its gorgeously grainy texture oatmeal is a brilliant natural scrub and all over exfoliant. For perfectly smooth skin combine two cups of brown sugar, half a cup of oats with two tbsps of lemon juice and half a cup of grapeseed oil. Mix it all in together and add a bit of your favourite oil for a personal touch. Use over your body to scuff away dead skin cells and leave your limbs feeling extra soft. That's right, this is no ordinary hair mask, it's a vegan friendly way to touchable tresses. No eggs, no milk just pure avocado love. Oh and lemon. Obvs. You'll need one avocado, a tsp of sea salt, a tsp of lemon juice and a tbsp of aloe gel. Mash your avocado in a bowl and add in the rest of your ingredients. Apply to damp hair for 30 minutes for a replenishing treatment. Happy mashing. Oily skin sufferers, listen up. There's a way to tackle that unwanted dewy finish without fiddling around with blotting sheets. Honest! Take one part cornstarch, one part French green clay (and a sprinkling of cocoa powder if you want a slight tint). Mix it together, find a pretty jar to store it in and you're done. Now that was easier than a trip to Boots wasn't it? Hands up. We did try rubbing strawberries on our teeth when we heard Britney Spears did it but turns out we weren't doing it right. Apparently just eating them doesn't count. 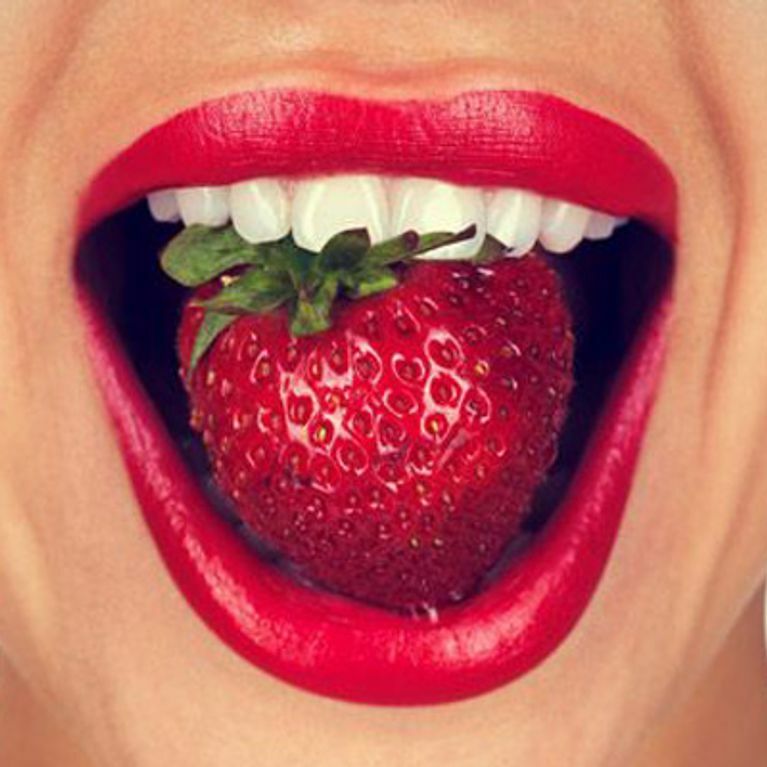 For pearly whites without the pain of laser treatment mash up strawberries in a bowl and dip your toothbrush in it. Make sure you rinse using warm water and a pinch of bicarbonate of soda to reduce sensitivity. A bright, white smile to match Ms Spears and the rest of Hollywood's elite will be yours. Coconut oil is a bit of a miracle worker both in the pantry and on your pores. Turns out, it even removes mascara too. Get a small amount on the tips of your fingers and rub onto your lashes using small circles. Wipe off the smudges with a damp cotton pad and you're done. Lovingly restored, mascara-free lashes in a matter of minutes. Calling all coffee, red wine and fizzy drink lovers - if the strawbs don't quite do the job then try rubbing apple cider vinegar on your teeth and rinsing with water (thoroughly). For anyone conscious of age or sun spots, you can dab a few drops of cider vinegar on them over night to lighten the colour. Magic hey! No one likes an itchy, flakey scalp, especially when you've got a hot date on the cards, so getting those white bits under control is a must. For an easy at-home recipe add four tbsps of coconut oil to two tbsps of lemon juice and one tbsp of grapefruit juice. Here's the scoop. Part the hair down the centre and apply your fruity mixture using an application brush (the ones you get in the DIY home dye kits). Massage your scalp and leave the treatment for 20 minutes before washing as normal. Not convinced yet? It'll even help promote hair growth and shine and get rid of product build up. That's one multi-tasking hair mask we're down for. That cornstarch you've been storing away for thickening up your ragù sauce could come in handy for thickening up your lashes too. Use a toothpick to scrape some mascara out onto a small dish, add a dot of cornstarch and blend. Roll your mazzy brush into the mixture and apply for lashes that would do a Kardashian proud. If your hair's a bit meh, eugh and generally ick you can liven it up with a homespun remedy. The secret? Douse your limp locks with an apple cider vinegar rinse to revive shine and get it back to its smooth best. Sure, it's not the most pleasant of smells but it's worth it for Rapunzel tresses. For a five minute hair rinse mix one part apple cider vinegar to one part water and pour into a spray bottle. After shampooing spritz the blend onto your hair and massage. Let it sit for a few minutes to get all the goodness and rinse. No conditioner necessary. You can always add in a few drops of your fave essential oil if you're really put off by the smell. Try something like peppermint oil to stimulate hair growth or cure an itchy scalp with soothing chamomile oil. Over done it on the tanning mission? Don't fret. Where there's a bottle of apple cider vinegar there's a solution for everything. And we mean everything. A vinegar bath isn't exactly our idea of pampering, but it'll sure soothe that sunburn. Add a cup to your bath and soak for ten minutes and you'll be able to sleep like a baby. Between winter and doing the chores our hands can really suffer from dry skin and there's no quicker way to soften them up than with a pantry oil treatment. Mix two tablespoons of sugar into one hand and add the same amount of olive or coconut oil. Rub the mixture together and spread all over your hands, preferably over the sink to avoid making a mess. Then just rinse well and apply a few drops of oil to moisturise.Two ingredients, two minutes, once a week. What's not to love? Done with the glitzy manicure obsession? You're in luck. There's no need to go searching for the best matte nails on the market, all you need is some polish and cornstarch. Sprinkle one eighth of a tsp into your polish to shift the shine. Garlic. You either love it or you hate it but after what we're about to tell you, you'll be a convert for sure. It's been used in traditional medicines for hair growth for many years thanks to its high sulphur content. You can see where this is going. Crush a few cloves, add in some coconut oil and boil for a few minutes. Allow to cool before massaging into the scalp. Kate Middleton tresses here we come. A manicure wouldn't be complete without showing your cuticles some TLC and there's no better way to kick them into touch than with some cooking oil spray. Yep. Cooking spray. Just make sure it's garlic-free. Stubborn knots can be tough to get out especially if you've got curly locks, but with this household staple you'll never need a Tangle Teezer again. To make your own spray, simply mix equal parts apple cider vinegar and water and spritz on after conditioning. Rinse through and enjoy a knot-free mane! Forget adding a slice of lemon to your G&T, rub a slice on your stretch marks instead. The natural bleaching properties in the fruit work to lift the reddish hue and buff away dead skin cells. So slice a lemon in half and rub it on your areas of concern on a daily basis to lighten your scars. Those of us that haven't been blessed with tiny Miranda Kerr like pores are always looking for ways to make them less noticeable and apparently little red tomatoes can help. Combine two-four drops of lemon juice with one spoon of tomato juice and apply for 15 minutes. Outrageous but totally awesome. Eggs on toast? Sure. Eggs on your tresses? Wait - hear us out. Eggs are packed full of omega 3 fatty acids, making it the perfect conditioning treatment for your locks. If going pure protein is a little too much for you, just whip up an egg and pour in your regular shampoo. NB you might wanna watch the shower temp, no one wants a scrambled shampoo job. Cinnamon doesn't just smell good and taste delicious, it also makes for a great lip plumper. Add a pinch of powder to your favourite lip gloss for an Angelina worthy pout. Pucker up! 22. Strawberries between your toes? Now this one might be a bit tickly but if you can fight the fidget it's so worth it. Get your hands on eight strawberries, two tbsps of olive oil and one tsp of kosher salt and mix into a paste. Massage all over your feet from the heel to toe, rinse and dry. Not only will this handy trick get your feet sandal ready, they'll smell pretty sweet too! A home remedy that manages your hairy upper lip and beats the salon sting sounds like something worth trying. To rid your face of unwanted hair take one tsp of honey, one tsp of sugar and a few drops of lemon juice. Mix it up to make a paste and heat in the microwave for three minutes. Touch it to test the temperature before applying. Now, take a strip of wax paper and place over the hair and pull it off in the opposite direction. Voilà! Waxing made easy (and cheap!). Did you know soaking your warts and all in apple cider could save you a drs appointment? Neither did we. Apparently, wrapping your warts in cider-soaked cotton wool and securing with a plaster could be the next best thing. It's like the freeze treatment just without the sting or the embarrassing, 'So I have a wart' convo. If there's a power fruit you need in your shopping basket right now it's gotta be a lemon. When its not busy speeding up your metabolism and fighting fat it's great for giving you a post-work glow. Just mix equal quantities of lemon juice and rose water and apply on your skin for an instant pick-me-up. That counts as one of your five a day, right? Try soaking a couple of square cotton pads in green tea and laying them on your peepers. The caffeine helps to shrink the appearance of blood vessels while the antioxidants get to work on inflammation. Keep a cold batch of tea in the fridge for those morning emergencies. All out of dry shampoo? That's ok, because cornstarch makes for an awesome substitute for your usual Batiste Blush. Refresh your locks by sprinkling some cornstarch on your roots and brush through. Bye bye greasy tresses. Say hello to papaya, your new BFF. This pear shaped fruit acts as a natural exfoliator, removing dead skin cells and breaking down the inactive proteins. It also helps to reduce blemishes whilst hydrating the skin. Mash it up with a dollop of honey and yoghurt and you'll have yourself one multi-tasking face pack. Tousled beach waves have never been so easy and you don't have to go anywhere near the sea to get them. Result. All you need is an empty spray bottle, salt and water. Dissolve a tsp of table salt in a cup of warm water and spray liberally over your roots. And voila - dreamy beach waves that'll knock him off his surf board. You've lit the candles, dimmed the lights and hit the classical music but a bubble bath just ain't the same without those tingling salts to wash your aches and pains away. Why not make your very own? All you need is some epsom salt, grapeseed oil, essential oil, a mixing bowl and a cute little jar to put it in. There's only a few simple rules. For every cup of salt add 1/4 cup of grapeseed oil and 3 drops of essential oil, mix it up and scoop into jars. Top it off with some ribbon and you've got yourself an adorable gift to self or a treat for your mumma. Even if you haven't got a sweet tooth you'll wanna give this a go. It smells delicious, it makes your hair shine like nothing else and you can get away with a sneaky spoonful of sugar along the way. Result. Pour the syrup into your hair and cover with a shower cap for 20 minutes. You can dilute with water if it's too thick. It's great for anyone suffering with dry hair or for those in need of a moisture drench. Freshly squeezed orange juice is great for quenching your thirst both inside and out. Make a homemade skin peel with cornstarch and orange juice for a face pack that tightens and brightens. Blend 25-30 mint leaves with 30-40 parsley leaves in half a cup of yoghurt (the Greek stuff's pretty good) and apply all over your face to help ease sensitivity. Who knew fresh mint could do more than just garnish your spuds? This one's a straight up time saver and who doesn't love one of those? All you need is one tbsp of baking soda, one tbsp of sugar and two tbsps of water. Mix it together to make a paste, massage onto wet skin then rinse and pat dry. Flawless pores and not a blackhead in sight. We know what we'll be doing tonight. No interruptions. As strange as it sounds, that apple cider vinegar you've been dressing your salads with can also double up as a pore-perfecting toner. For real. This unexpected beauty hero can regulate your skin's natural pH, meaning your skin will fight breakouts and strike the perfect balance between dry and oily. Dilute your vinegar with two parts water and swipe over skin with cotton wool balls for baby soft skin. Wanna know how to spice up your complexion? Turmeric should do the trick. This potent spice is great for fading skin discolouration and post-acne scarring. Simply mix it with a few drops of lime juice and leave on the skin for 20 minutes. We're no Jamie Oliver but even we can manage that! Here at sofeminine HQ we're all for showing your natural beauty (we don't care what you say your freckles ARE cute). But, for those of you who don't see eye to eye a ginger powder and milk mask might just be your ticket to porcelain skin. You gotta try these things once. Yep. You heard it here first. Those juicy tomatoes aren't just amazing with a fry up they're also great for treating acne and breakouts. Take one or two tomato slices and rub them onto your problem areas. Do this twice a day every day and you'll notice your acne fade away. If its good for your diet it's likely to be good for your skin and hair too and that's exactly the case when it comes to the sweet almond milk. Packed with antioxidants, vitamin E and omega 3 fatty acids it's fab for removing dirt and grime from those long-suffering city pores. Lightweight and versatile, this kitchen cupboard filler beats perfumed makeup remover any day. Just apply a few drops to your face cloth and gently swipe it over your face to take your make-up off the natural way. Is there anything honey can't do? We're buzzing over the never ending skin benefits of this sweet treat especially since it can help in the wrinkle department. Hallelujah. Mix a couple of tbsps of honey with two egg whites and apply the mask to your face for a creamy smooth complexion. Got any more suggestions? Dish your DIY secrets by tweeting us @sofeminineUK.